We’d love your help. 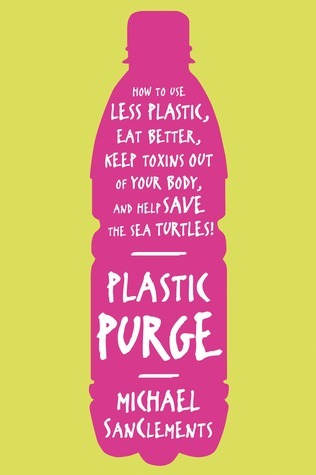 Let us know what’s wrong with this preview of Plastic Purge by Michael SanClements. Now a Denver Post #1 bestseller. Plastic is everywhere we look. Our computers and children's toys are made out of it, and our water and slices of American cheese are packaged in it. But why is there so much and what is it doing to our bodies? Is it possible to use less plastic and be happier and healthier? In Plastic Purge, ecologist, SanClements has put together the most u Now a Denver Post #1 bestseller. Plastic is everywhere we look. Our computers and children's toys are made out of it, and our water and slices of American cheese are packaged in it. But why is there so much and what is it doing to our bodies? Is it possible to use less plastic and be happier and healthier? In Plastic Purge, ecologist, SanClements has put together the most up-to-date and scientifically-backed information available to explain how plastics release toxins into your body and the effect they have on your and your children's health. Both approachable and engaging, Plastic Purge provides easy-to-follow advice for how to use less plastic, thereby reaping the benefits such as eating a healthier diet and living with less clutter. Dividing plastics into three separate categories: the good, the bad, and the ugly, SanClements shows you how to embrace the good (items like your phone or medical equipment), avoid the bad (food storage containers and toys that contain toxic chemicals), and use less of the ugly (single-use plastic that's just plain wasteful). To ask other readers questions about Plastic Purge, please sign up. This book was incredibly informational, yet amazingly digestible and a bit humorous as well. I would recommend this book to everyone that is looking to gain some insight about how we can be care for our environment and ultimately ourselves. I would even consider reading it again in the future! Fabulous! I already considered myself a semi-tree hugger, but reading actual numbers and facts about how BAD plastic can be for mot only the environment, but also your body, has really made me re-think a lot of interactions I have with plastic. I mean, who knew receipts were leaching BPA into our bodies?? I'm definitely taking a few suggestions from this book into my everyday life. I received a free copy of this book from the Goodreads First Reads program in return for an unbiased review. First of all, a confession. Even though I am an ecologically conscious, self-aware, Green Party geek, I was a little bit worried that this book would be too preachy and guilt-inducing to read. I was relieved to find that it was readable, entertaining, and that the author acknowledges (fairly often) that change might be difficult, and that each of us will make our own risk-benefit analysis. I received a free copy of this book from the Goodreads First Reads program in return for an unbiased review. First of all, a confession. Even though I am an ecologically conscious, self-aware, Green Party geek, I was a little bit worried that this book would be too preachy and guilt-inducing to read. I was relieved to find that it was readable, entertaining, and that the author acknowledges (fairly often) that change might be difficult, and that each of us will make our own risk-benefit analysis. Personally, I would have liked a bit more 'crunchiness'. There is a bibliography (broken down by chapter), and the sources are varied. Several are environmentally based sources which I haven't dealt with before, but there are also quite a few peer reviewed publications and a range of governmental agencies cited. This does help to mollify my inner skeptic, but it would have been nice to see more detailed endnotes and to be clear on which fact came from which reference. It would also be nice to see a bit more detail on the impact of endocrine disruptors and pthalates, but I appreciate that this might make the overall work less appealing to the widest audience (again - detailed endnotes would have been appreciated). There are a number of very useful sidebars and summary boxes, and I will be copying some of them to carry with me for easy reference when making consumer decisions. Although I found some of the information in the book depressing, none of that was *new* information. On the contrary, I found it encouraging to learn of advances in recycling technology, and even that there are companies successfully reclaiming fuel from plastic. As the author is an expectant father, there is a chapter devoted to reducing harmful plastic exposure to children and infants, and I was personally disturbed that he assumed that all infants will be formula fed. Paragraphs devoted to cloth vs paper diapers, not one sentence devoted to nursing vs. formula (and it would have been nice to have a discussion of the safety of plastics used in breast pumps). If he hadn't mentioned that parenthood was impending I would have put it down to male blind spot, but as it is I have to wonder what on earth he was thinking. As it is, that's my biggest issue with the book, and, to be honest, it's not that huge a flaw. I could only get through the first 30 pages of this book. I really wanted to go further, because the premise and content were so interesting to me, but the writing couldn't make up for that. When the word "downright" was used twice in one paragraph, and phrases such as "people went freaking crazy" and "Crazytown, right?" became frequent, I gave up. When I read about science and history, I get distracted if the text sounds like a Valley Girl conversation. For the first chapter or two or three, I was worried that this was going to be a book "preaching to the choir." It stands to reason the majority of the people who pick up this kind of book are the kind who already care and are trying to do the right thing for themselves and the environment. And while that's probably true, there is *much* to learn, as I soon discovered. "Even as a conscientious co For the first chapter or two or three, I was worried that this was going to be a book "preaching to the choir." It stands to reason the majority of the people who pick up this kind of book are the kind who already care and are trying to do the right thing for themselves and the environment. And while that's probably true, there is *much* to learn, as I soon discovered. I'm buying this as a gift for everyone I know this year, and you'll want to too. Buy it for yourself first! Reading this book depressed me! I’ve always considered myself to be somewhat eco-conscious. After all, I’ve recycled since the very first Earth Day when I was in middle school (and got my parents to join me), I brought my own re-usable bags to the grocery store before it was cool, used cloth diapers for my children and even when we travel, I collect recyclables until we can find a place to recycle them. I’m so trained that it is depressing to read current headlines that recycling as we know it m Reading this book depressed me! I’ve always considered myself to be somewhat eco-conscious. After all, I’ve recycled since the very first Earth Day when I was in middle school (and got my parents to join me), I brought my own re-usable bags to the grocery store before it was cool, used cloth diapers for my children and even when we travel, I collect recyclables until we can find a place to recycle them. I’m so trained that it is depressing to read current headlines that recycling as we know it may not have a future. And, even when I thought we, as a country and a world were doing well, I was dismayed to learn that only about 10% of the plastic produced globally is recycled. This book was published in 2014 (the first thing I looked at before reading) and I’m sure much has changed but, unfortunately, not necessarily for the better. I admit I skimmed over some sections, but it was a quick, well researched and informative, albeit depressing, read. There's nothing wrong with wanting to cut back on plastic but if you are reading this book you probably already use reusable grocery bags and stainless steel water bottles so you might as well skip reading this book. - The book begins with a few interesting stories about the history of plastics which I feel could have been expanded upon in more detail. - The writing style is overly casual which often trivializes the author's intended arguments and makes assumptions that the reader wouldn't want t There's nothing wrong with wanting to cut back on plastic but if you are reading this book you probably already use reusable grocery bags and stainless steel water bottles so you might as well skip reading this book. - The writing style is overly casual which often trivializes the author's intended arguments and makes assumptions that the reader wouldn't want to be "bored" by scientific details. - The author also assumes that BPA exposure is everyone's highest concern. A fact that overshadows some bigger environmental and health issues. For example, In list of common BPA exposure pathways Airline Boarding Passes is at the top. It may be surprising that BPA is in boarding passes and receipts but anyone flying enough to worry about BPA expsosure through boarding passes has some bigger carbon footprint issues to deal with. - The suggestions for cutting back on plastic in daily life were pretty obvious. This book may have been written a year or two before Keurig and Tassimo coffee makers took over the coffee industry and thus it is sadly missing the advice to not use those products. But again, any conscious consumer should realize this on their own. I really enjoyed reading this. Personally, I have taken quite a few science classes and wish it could have been more in depth on the chemistry, but that is the reason for the resources/bibliography section. Ever since I was younger, I have been drawn to preserving our earth, or at least trying to keep it looking nice by picking up trash and trying to recycle and reuse as much as I can. But I like how this book showed that some plastics are good (and some bad and ugly). I also did not know about t I really enjoyed reading this. Personally, I have taken quite a few science classes and wish it could have been more in depth on the chemistry, but that is the reason for the resources/bibliography section. I have read many books on how to live a more environmentally friendly lifestyle. But most of them make such extreme recommendations that I end up morphing into a belligerent teenager while reading them. Mid-way through the book I start thinking, You won't ever let me have any fun at all. You're the meanest author ever. So I started reading Plastic Purge with some trepidation. But I quickly realized that the author is the Mike Brady of environmentalists. He wants what's best for us and he's gentl I have read many books on how to live a more environmentally friendly lifestyle. But most of them make such extreme recommendations that I end up morphing into a belligerent teenager while reading them. Mid-way through the book I start thinking, You won't ever let me have any fun at all. You're the meanest author ever. So I started reading Plastic Purge with some trepidation. But I quickly realized that the author is the Mike Brady of environmentalists. He wants what's best for us and he's gently encouraging us to do the right thing. But he's also very understanding when we fall short of the mark. When I was at the Monterey Aquarium last month, I saw their plastics in the ocean exhibit and it is truly disgusting. I saw this book at the library and while a lot of the information included is nothing new, it was good to get a refresher on plastics and their alternatives. Interesting history of plastic. A little sad to see that recycling isn't doing as well as we hoped it would. A little too hard on bioplastics, which I think can be a good path forward. Good suggestions how to reduce plastic exposure if you are concerned. Informative! I learned a ton about products I use everyday & helpful hints to reduce the use of harmful plastic. Thanks Goodreads! *** Please note I received this book for free from Goodreads First-reads. This is a very informative book ! Would highly recommend it. The info was better than two stars, but the intended audience appeared to be people who know literally nothing about science. The two stars are for my subjective reading experience. It was very informative AND engaging. There is so much interesting information in this book. Even if you're not an environmentalist the history of plastic is so engaging, really. Shame on him for not included breastfeeding as a way to keep plastics and their by-products out of our children. If you breastfeed exclusively, there is no need for any of the baby-feeding garbage made out of plastic and if you need to pump, glass bottles are available that will fit on a Medela pump. Note to self: Quick, easy read that provides useful and realistic ideas for reducing the use of plastic materials in daily life. Easy to read explanations. A good primer, but I wish it addressed appliances more. This book is a must read for everyone! I learned a lot from this book, although I found the tone to be a little uneven and at times annoying- he jokes about not getting into the boring science details at one point but umm this IS a science book and he is a scientist. Then he does get into some rather technical terms later, with no explanation. And later references Urban Dictionary to explain what a frenemy is. Eye roll. Most of the book was okay though as far as tone. Anyway, onto what I learned - plastics numbers 2, 4, 5 are relativ I learned a lot from this book, although I found the tone to be a little uneven and at times annoying- he jokes about not getting into the boring science details at one point but umm this IS a science book and he is a scientist. Then he does get into some rather technical terms later, with no explanation. And later references Urban Dictionary to explain what a frenemy is. Eye roll. Most of the book was okay though as far as tone. Anyway, onto what I learned - plastics numbers 2, 4, 5 are relatively good and low risk of leaching nasty chemicals. These are used for things like Tupperware and food containers. 1 is okay- used in soda and water bottles, some leaching risk. Plastic number 3 (PVC) is BAD BAD BAD. Used in shower curtains and plastic wrap. Although here's where the book starts to be lacking- burning PVC is how the bad stuff that can mess up your hormones comes out, and shower curtains are bad because they release chemicals in the air (that lovely plastic smell) but he doesn't make clear how else plastic wrap can affect your food. Same for some of the other plastics- leaching can occur at high temperatures- well, what temperatures?! At least explain why you didn't have that detail, if it's because there's too much variance in plastic materials or something. Other interesting note- one reason it's a pain to recycle plastics is because the 7 types are so different and are difficult to sort automatically. Someone smart get on this. The last part of the book is suggestions on how to reduce plastic in your life, which was fairly useful. Note to self- stop buying soda cans, apparently the plastic bottles are in fact safer. Or go with glass. The cans are lined with BPA. And about BPA- apparently BPA free doesn't always mean safe, some of the BPA replacements also have hormone disrupting chemicals. Aaand the biggest source of BPA? Thermal printed receipts! Great, easy to read. Includes both a background on plastics and how to reduce your usage. SanClements also remains balanced, sharing the benefits of plastic in our world today, while also discussing the negative affects. - "Only plastics # 1 and #2 are routinely and efficiently recycled" pg 56. (i.e. soda bottles, salad dressing bottles, detergent bottles, milk jugs). - "85% of plastic ends up in landfills or as litter" pg 68. - Avoid aluminum cans, due to BPA linings on the inside, w Great, easy to read. Includes both a background on plastics and how to reduce your usage. SanClements also remains balanced, sharing the benefits of plastic in our world today, while also discussing the negative affects. - Avoid aluminum cans, due to BPA linings on the inside, which is a known endocrine disruptor (aka cancer concerning) (Muir Glen and Eden Foods don't use BPA in their cans). - Avoid Phthalates, which are often found in cosmetics. Easy way is to avoid scented soaps and lotions. Buy some reusable cloth bags, instead of the plastic ones for produce.